The Martin Archives is a unique inside look into C.F. Martin & Co.'s reign as America's oldest and most revered guitarmaker viewed through a selection of images, correspondence, documents, and reproduced artifacts chosen from some 700,000 items the company has amassed over nearly two centuries. Many of these have lain unseen in the Martins' attic or vault for generations. From the concert halls of the pre-Civil War United States to the Grand Ole Opry stage to Woodstock, Coachella, and beyond, Martin's instruments have been on hand to give voice to the human spirit. 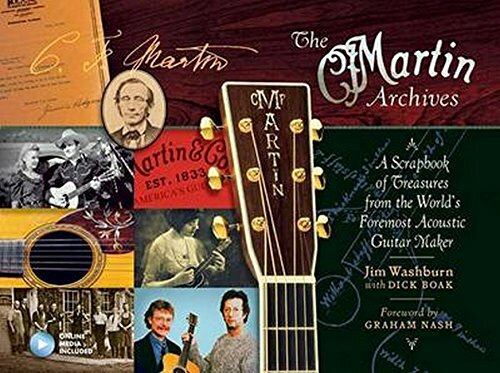 The Martin Archives offers insights into those instruments and the persons who made them, as well as the times the Martins lived through. While some guitarmakers predate the advent of the business computer, Martin predates the typewriter, electric lights, and even the steam locomotive, and its archives reveal what an interesting ride that's been. In addition to all that is on its pages, The Martin Archives also contains pockets with reproductions of illuminating bits of its history, including old company records, letters from stars such as Gene Autry and Jimmie Rodgers, the purchase order for the first D-45 guitar, a handwritten history of the company on its 100th birthday by Frank Henry Martin, and other palpable delights.